So apparently today there was a big classic car show lined up along the promenade on Felixstowe beach - lucky for us Sonia and I bumped into it completely by chance whilst on our way somewhere else. 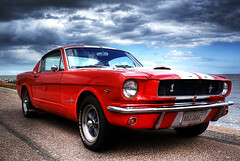 I managed to get quite a few pictures of loads of dead cool cars but for now I thought I would share just this one of a Ford Mustang which I converted to HDR and added a little bit of the Orton effect to. I don't know if this is a textbook HDR and I know a lot of it is pretty dark, but I like the overall result for what it is.